Nellie Mae Jackson Colbert, age 91, left this world on June 16, 2015 and now resides in her Heavenly Home with her Lord and loved ones who went on before her. 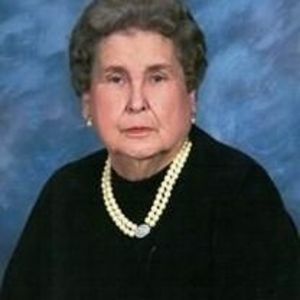 Nellie was born on April 10, 1924 to the late Clyde Jackson and Lena Jackson Jackson in Wilson County. She lost her father at a very young age and was raised by her mother and step-father, Moses Taylor. Nellie and her late husband of 63 years were married on July 20, 1940 and raised four beautiful children together. She was a charter member of Oakview Baptist Church that was established in 1951. Her most cherished position held, was that of Wife and Mother. She is preceded in death by her husband, Robert Lee Colbert, Sr; sisters, Evelyn (Dolly) Bottom, Pattie Winders New, one son-in-law, James Henry Harrell and one infant grandson. She is survived by her sons, Robert Colbert, Jr. (Paula) of Rocky Mount, NC; Tommy Colbert (Pat) of Chesapeake, VA; Tim Colbert (Crystal) of North Myrtle Beach, SC; daughter, Patricia Colbert Harrell of Pinetops, NC; grandchildren, Lori Edwards (Brett), Tina Narron (Jason), Billy Colbert (Sherri), Tammy Wiseman, Jody Etheridge, Katie Moss (Jeremy), Stephen Kinney, Dwight Harrell (Lorie), Marshall Harrell (Renee) and Shannon Bullock (Mike); twenty-five great-grandchildren and one great-great grandchild; brothers, Billy Taylor (Jessie Dean), Jimmy Taylor (Katie), Elbert Taylor (Faye) and Ray Taylor (Jean); sisters, Mary Alice Hodges, Sybil Lamb and Dorothy Stallings (Jim); one brother-in-law, Bill New. Visitation will be held on Friday, June 19, 2015 at Oakview Baptist Church, 2412 Arlington Street, Rocky Mount, North Carolina from 10:30 AM until 12:00 NOON. The funeral service will begin at 12:00 NOON at the church with Pastor David Taylor officiating. Interment to follow at Pineview Cemetery alongside her husband. Johnson Funerals and Cremations, 661 English Road, Rocky Mount, North Carolina 27804 is in charge of the Arrangements. If you have any questions or need assistance, please call Johnson Funerals and Cremations at 252-937-8886.